The Bolo Tie is the official tie of New Mexico, Texas and Arizona. 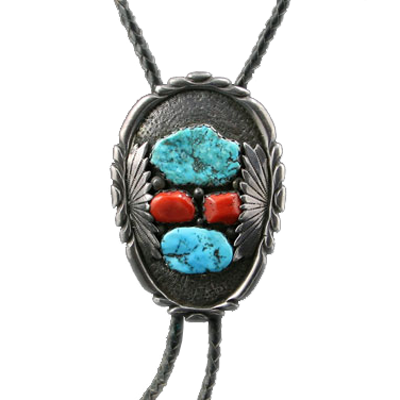 Popular with men and women, bolo ties are a classic southwestern adornment. Bolo ties can be worn by men or women, and we often get requests to convert these into pins and pendants because of the beautiful craftsmanship. Charlotte Dishta - Zuni Multi-Stone Inlay and Silver Eagle Bolo Piece c. 1980s, 1.5" x 1.625"
Esther and Herbert Cellicion - Zuni Turquoise, Coral, Jet, Mother of Pearl, and Silver Rainbow God Bolo Tie c. 1960-70, 2.75" x 1.25"
James Little - Navajo Turquoise and Silver Bolo Tie with Crow Mother Kachina c. 1957-67, 3.5" x 2"
Joe Zunie - Zuni Eagle Dancer Multi-Stone Inlay and Silver Bolo Tie c. 1960-70s, 6" x 2.5"
Mark Chee - Navajo Turquoise and Silver Bolo Tie c. late 1960s, 3.75" x 2.75"
Navajo Coral and Silver Bolo Tie c. 1970, 2.75" x 2"
Navajo Turquoise, Bear Claw and Silver Bolo Tie c. 1960-70, 3.5" x 2.5"
Ralph and Lillie Kallestewa - Zuni Multi-stone Inlay and Silver Rainbow God Bolo Tie c. 1970s, 2.5" x 2.5"
Zuni Multi-stone Inlay and Silver "Chief/Sunface Kachina" Bolo Tie c. 1950-60s, 1.75" x 2.25"
Zuni Multi-Stone Inlay and Silver Eagle Dancer Bolo Tie c. 1957-67, 2.5" x 2.25"
Zuni Multi-Stone Inlay and Silver Gahn Dancer Bolo Tie c. 1950s, 2.75" x 1.75"
Zuni Multi-Stone Inlay and Silver Thunderbird Bolo Piece c. 1960s, 1.125" x 1"
Zuni Multi-stone Inlay and Silver Thunderbird Bolo Tie c. 1950-60s, 2.5" x 2.375"
Zuni Multi-Stone Inlay, Silver and Leather Bolo Tie, circa 1955, 3" x 2.25"
Zuni Turquoise Channel Inlay and Silver Bolo Tie with the Shriner Design, c. 1957-67, 1" x 2.25"